The Alger family has been breeding dogs since 1992, including golden retrievers, goldendoodles, St. Bernard's, and huskies. The Alger family has over 30 years of experience breeding a variety of dogs. The family began breeding golden retrievers and St. Bernard's when David and Jennifer first moved to North Carolina, and slowly transitioned to huskies, golden retrievers, and now golden doodles. They really fell in love with golden retrievers for their friendly nature, easy training and obedience, and love of children. With 3 boys to raise, David and Jennifer knew they needed dogs that would play with their children but also be protective. 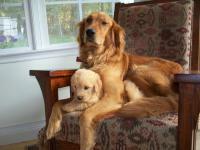 Looking back, it is the best decision they could have made, as retrievers and doodles make great family pets. Now we (Jonny and Lindsay) have continued the breeding experience with our dogs Abbie (mother, retired) and Bella (Abbie's daughter). Jonny started breeding in 2009, and we have had 6 litters since then. Our dogs are our pets and are treated as such. They are wonderful and produce top-of-the-line puppies that have beautiful coats and adorable personalities. Our dogs love to take runs with us, play in the park, meet new friends, and swim! They are very attentive to our daughter and are always looking to make everyone around them happy. 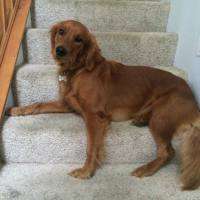 Abbie is a 10-year old AKC golden retriever with a fantastic personality. Everyone who meets her comments on how friendly, well-behaved, and playful she is. She loves to be around children and other animals and is a wonderful mother! Alex is an AKC retriever with a beautiful red coat. Alex loves to run around the yard and play, but he also loves to cuddle and have his belly rubbed. Alex lives in Avon, Indiana with his family. Bella is the daughter of Alex and Abbie. She weighs approximately 55 pounds and is 3 years old. She loves to run and play fetch, but also likes to cuddle in bed at night under the covers. She has an amazing temperament; her puppies will do wonderfully with children or as service animals. Bella and King Louie had their first litter together in December 2017. Bella will be breed in April 2019 with King Louie or another stud. 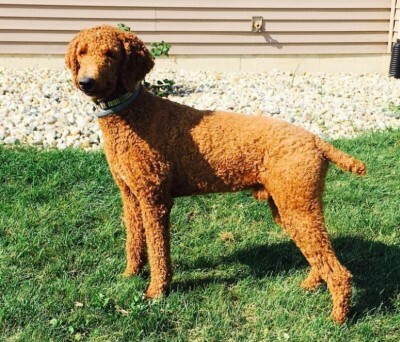 Louie is a 2-year-old AKC/CKC standard poodle. He weighs approximately 45 pounds and is red with white markings. He has a sweet temperament and loves children and other animals. He has been proven as a stud and produces puppies with curly coats, some with similar white markings to his own.